Has collecting lost its youth? Test your knowledge of Sherlock Holmes by trying our interactive crossword puzzle - the game's afoot! This issue of Studium Magazine is dedicated to the Sherlock Holmes enthusiast and admirer of the thinking man's detective. 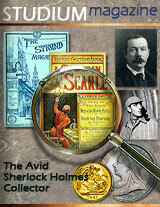 We cover a brief history of Arthur Conan Doyle and his struggle with the sleuth; the money of late Victorian England and what it bought in Sherlock Holmes' world; what memorabilia to collect when the bug seriously bites; the varied performances featuring Sherlock Holmes of radio, television, and the cinema; contents of the Strand Magazine, credited with the original publication of nearly all of the works of Sir Arthur Conan Doyle; an intriguing interview with collector Peter Blau of the Baker Street Irregulars; and multimedia and games related to the Great Detective.